The gentrification of Chinatown has been a hot topic in the past few years for good reason. 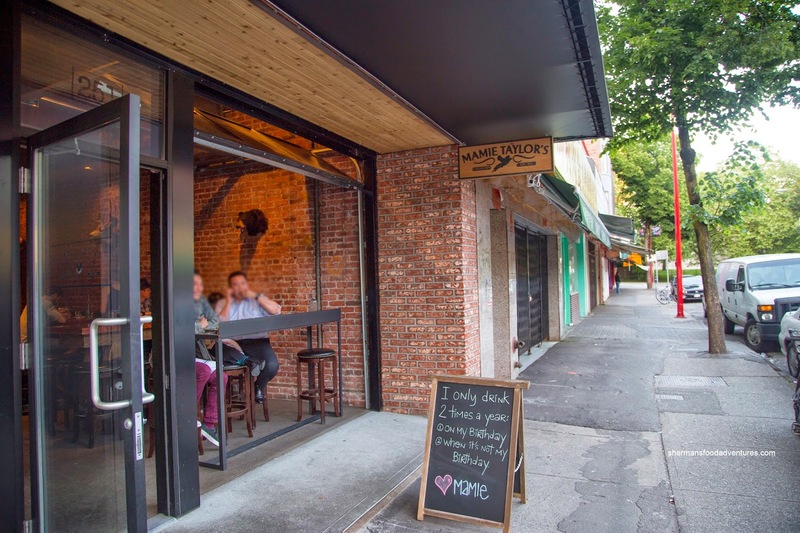 The once bustling array of grocery stores and fresh seafood shops are now practically empty as many patrons have gone to T&T, Richmond or their local markets. In their place, a variety of establishments have set up shop, creating their own brand of hipster vibe. Even the Chinatown Night Market is no more as of this year. After visits to The Union and The London Pub, we decided to hit up Mamie Taylor's after our softball game at Strathcona Park. If I was to tell someone that they could find Southern cooking in Chinatown even 10 years ago, it would've ended up in laughter. 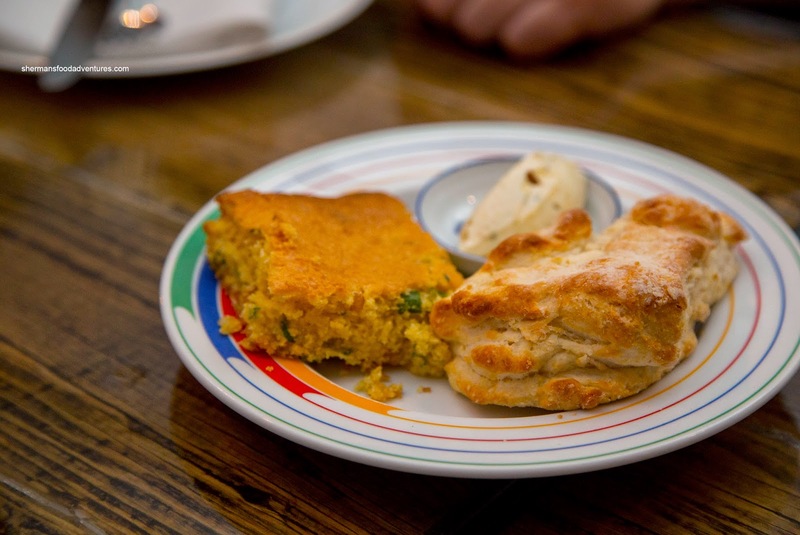 But not anymore... Milhouse, Miss Y and I ended up sharing the Cornbread & Biscuit served with jalapeno bourbon butter. I found the biscuit to be dry and crumbly where it really needed the sweet butter. However, Bear (who had his own order) disagreed and thought that it was just right. For me, I preferred the corn bread as it was moist and sweet. 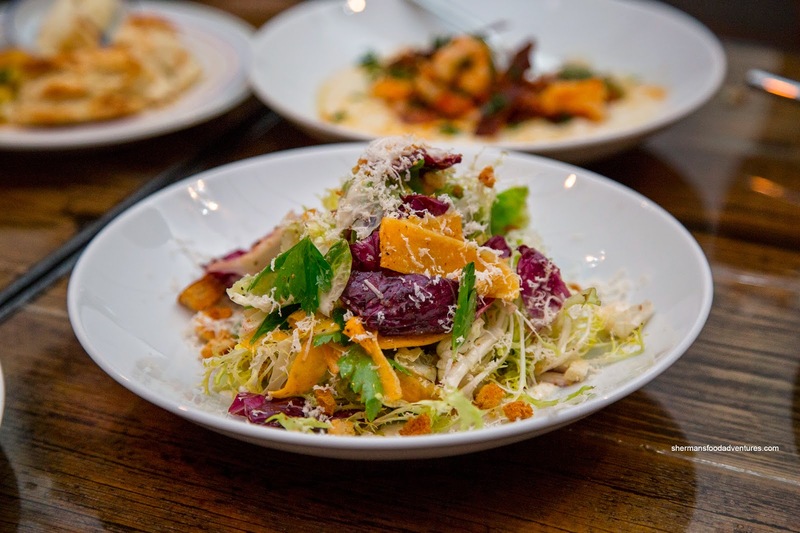 To feel a bit better about the impending heavy meal, we got the Brussel Sprout Salad. We liked the presentation as it was piled high with a rainbow of colours. There was an appealing crunch that went with the plethora of creamy and spicy horseradish ranch dressing. There seemed to be more of everything else other than the brussel sprouts though. Onto one of the more interesting items, we tried the Turducken scotch egg with turkey and duck sausage, tomatillo sauce and garlic mayo. Unlike many versions of scotch eggs, this one was practically perfect as the it was buttery soft with a slightly runny centre. It was encased in a meaty, while not greasy, sausage. The tart tomatillo underneath added a certain brightness that balanced the heaviness of the egg. Much to our delight, they had Fried Green Tomatoes on the menu. It was battered in a Parmesan crust accompanied by anchovy aioli and pine nuts. This was a well-executed dish as the green tomatoes were firm (as red tomatoes would become a wet mess) with a crunchy browned exterior. The spicy and salty aioli went well with the tart tomatoes as it added a creaminess. 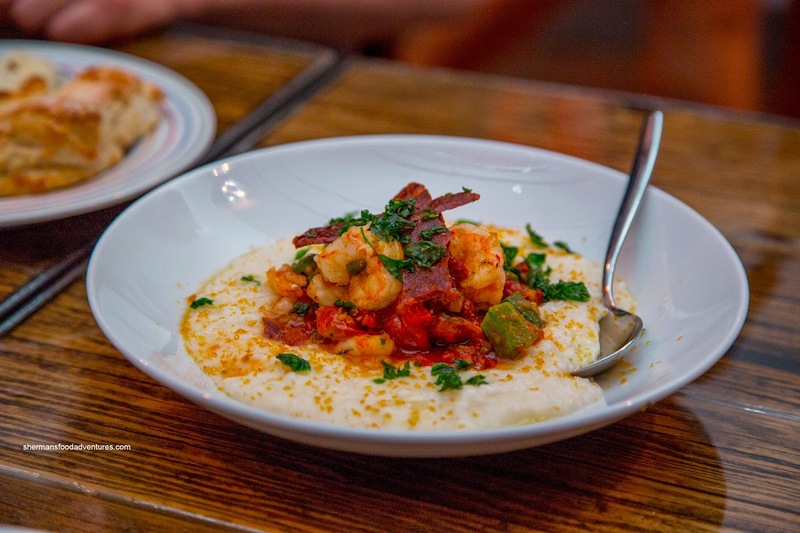 Off to some bigger items, we tried the Shrimp & Grits with spicy tomato, roasted okra, chorizo and bottarga. Although the grits were somewhat lumpy, I still enjoyed it since the flavours were on point. The combination of the spiciness of the chorizo, sweetness of the shrimp, saltiness of the bottarga and acidity of the tomato created a flavour party. As for the texture of the shrimp, it was meaty with a light snap. This was a result of properly cooking them just to the point of doneness. 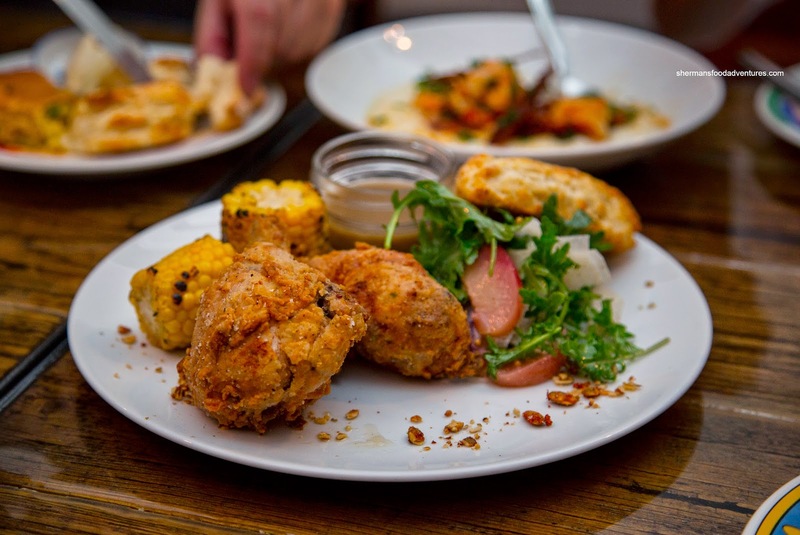 Of course we couldn't get out of there without trying the Fried Chicken with buttermilk biscuit, grilled corn, pickled peach baby kale salad and gravy. We found the breast meat to be relatively moist while the drumstick to be juicier (since it was dark meat). The skin was rendered where there was a definite crunch. The chicken and batter itself was not aggressively seasoned, but the balanced gravy (with a touch of booze) made up for it. 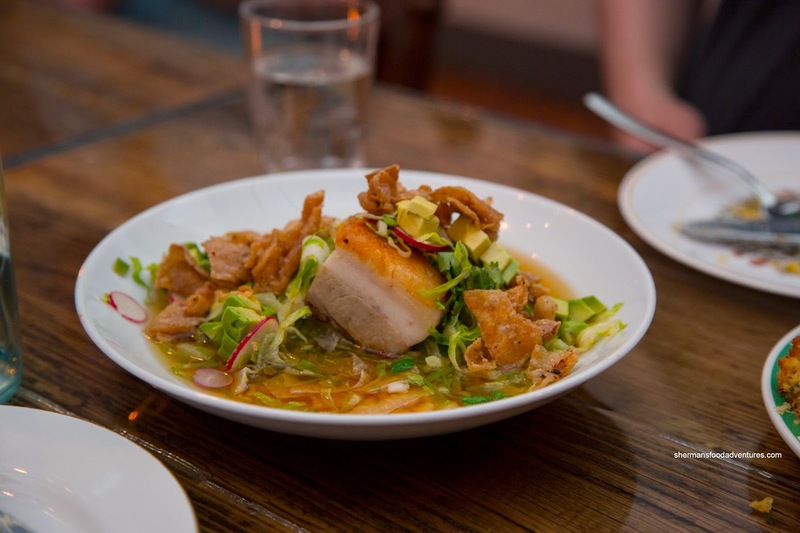 Judes went for the other dish we were contemplating in the Pozole Blanco consisting of pork belly, crackling, avocado, radish, hominy grits & chicken consume. Surprisingly, the star of the show was the consume as it was super flavourful. The pork belly was no slouch either being moist with a crispy skin. The cracklings didn't hurt things as they were light and crispy. 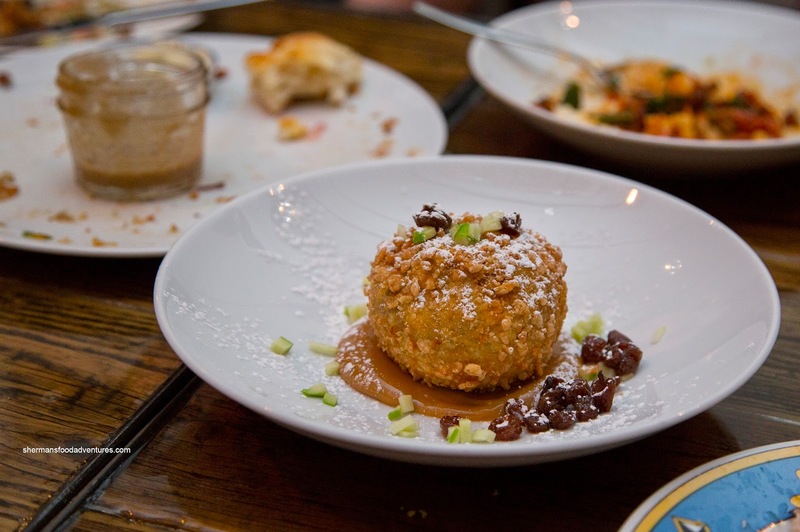 For dessert, Bear did the honours in ordering the Deep Fried Apple stuffed with vanilla ice cream and coated with a rice crispy crust atop milk caramel. A spattering of diced Granny Smith and raisins completed the dish. We all gave it a try and universally liked it. The soft apple gave way to "still frozen" ice cream which was accented by the sweetness of the caramel and raisins. You know what? We were glad to have persevered in trying out Mamie Taylor's, even though it was closed the last time. 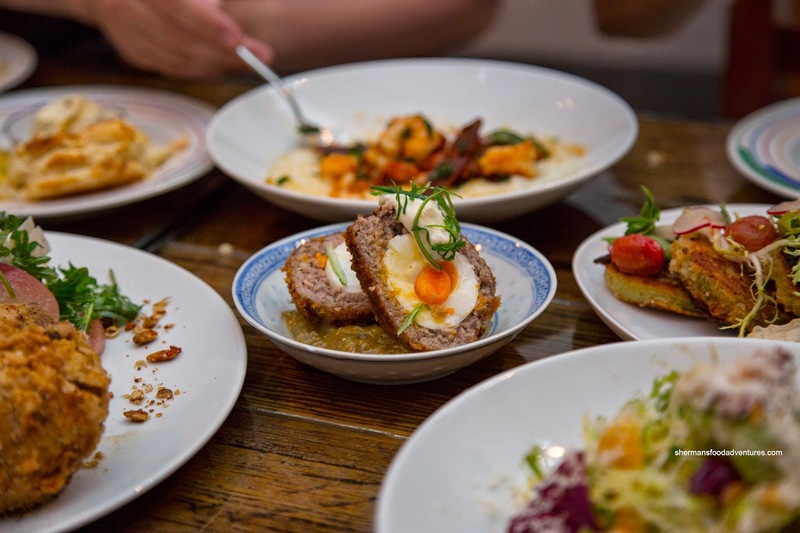 Turns out, the food is both interesting and pretty good. 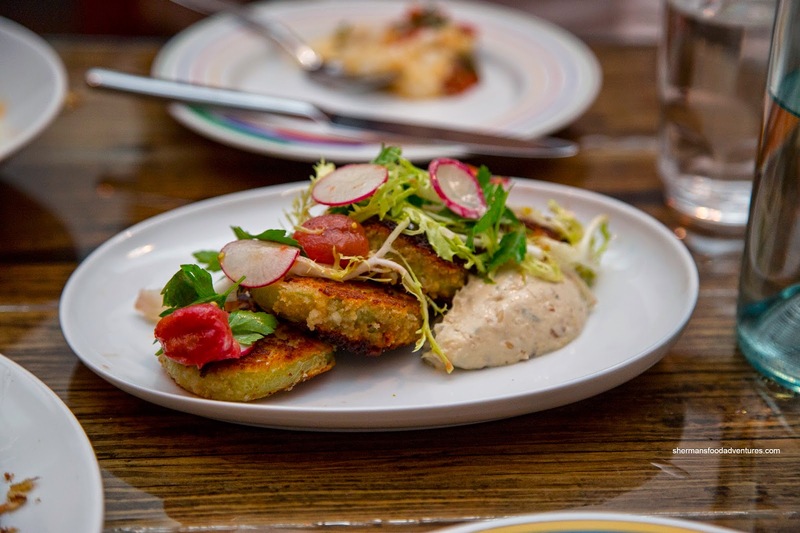 Thanks, Sherman, for the tip that Mamie Taylor's is doing fried green tomatoes. I haven't had them since last December in TO. I thought MT's pozole was the best one I've had outside Mexico -- go figure!